(1928)*^* - Panoramic view showing the St. Francis Dam with large reservoir behind it. 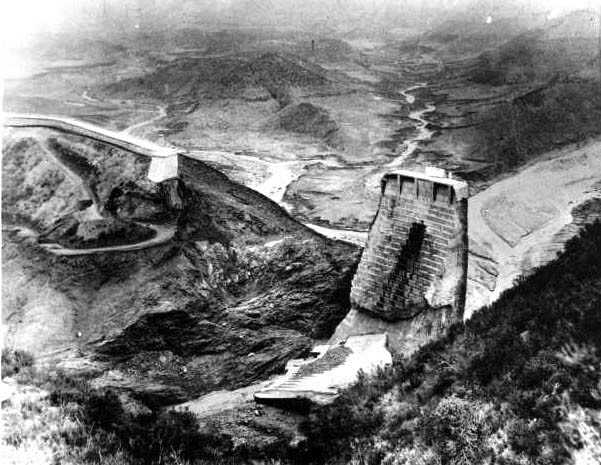 The dam was located in the San Francisquito Canyon, about 5 miles northeast of what is now Magic Mountain, California. 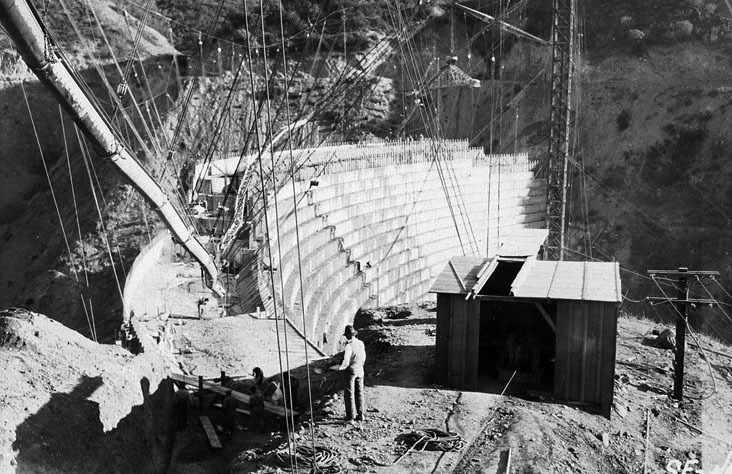 Construction of the St. Francis Dam began on March 9th, 1925. It was completed a year later, almost to the day. The colossal concrete structure was 205 feet high, 1225 feet long on its crest, 150 feet long at its base, and 160 feet thick at the stream level. 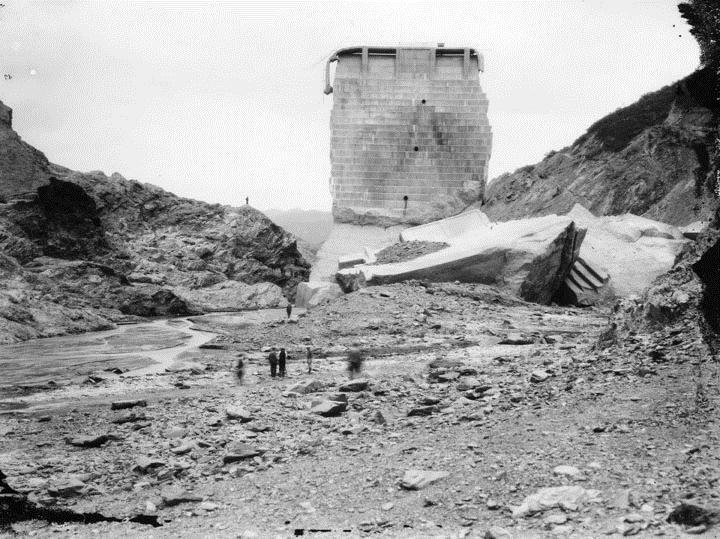 The St. Francis Dam failed catastrophically upon being filled for the first time, near midnight on March 12, 1928. 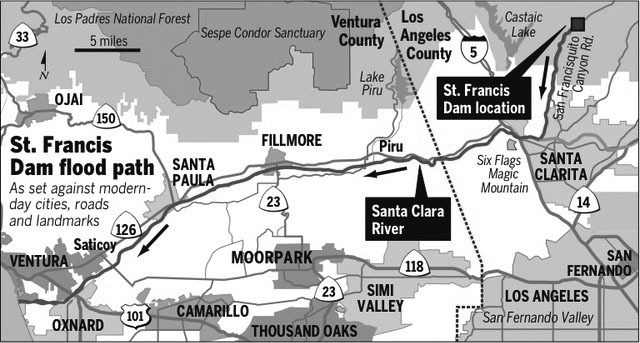 Over 450 people perished as the flooding waters raced through the San Francisquito and Santa Clara River valleys and continued on its 54 mile course to the ocean. It ranks as one of worst American civil engineering failures in the 20th Century. 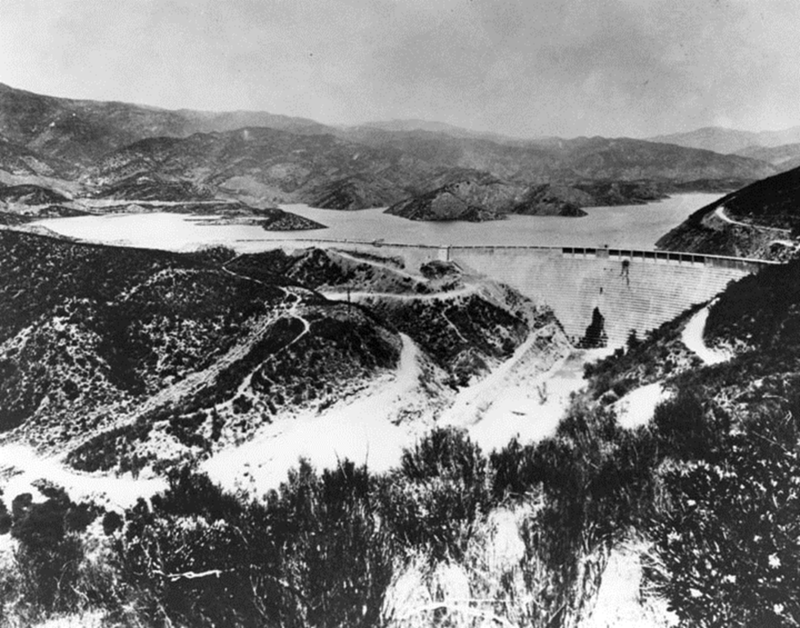 (1928)^^* – View showing the St. Francis Dam and water reservoir behind it shortly before the dam's collapse. It would take two years after its completion before the new lake behind it would be filled. The new reservoir would provide 38,000 acre-feet of storage from water flowing on the Los Angeles Aqueduct. (1928)* - St. Francis Dam as seen from the hillside. Note the man with the hat in the foreground. 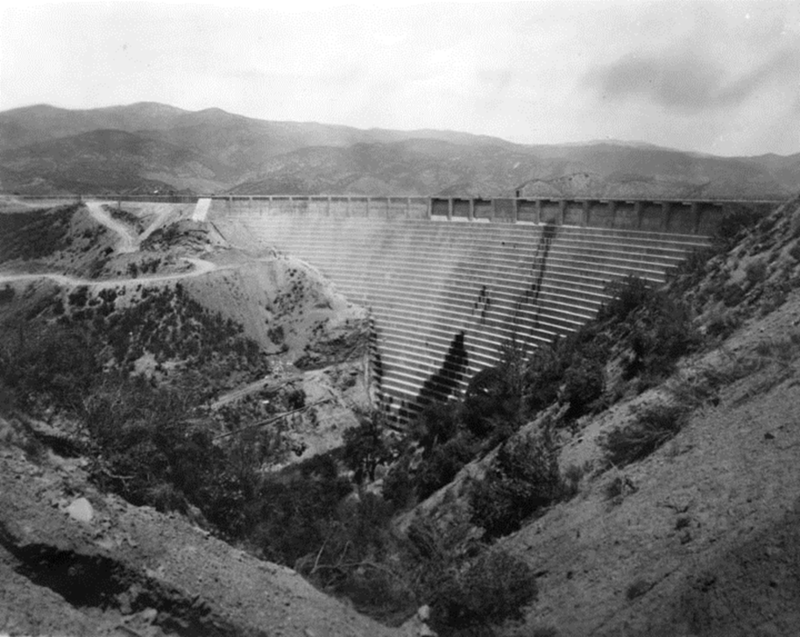 The concrete-arched gravity dam was built by the City of Los Angeles Bureau of Water Works and Supply (now DWP) under the supervision of its chief engineer, William Mulholland. 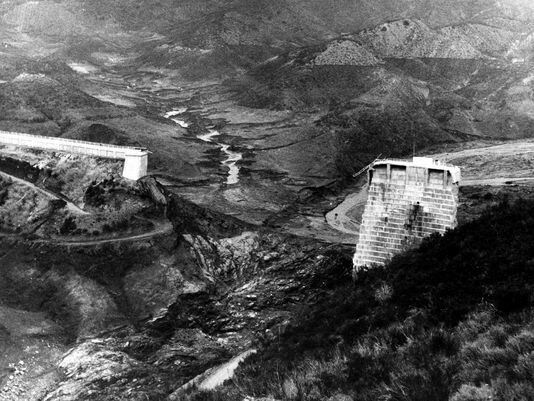 (1928)* - Close-up view of the St. Francis Dam shortly before being filled to capacity. 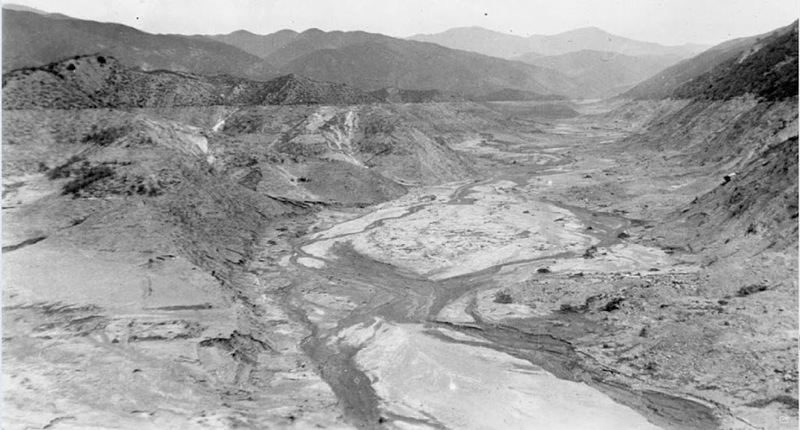 The St. Francis Dam was given an anglicized version of the name of the creek bed on which it rested (San Francisquito). 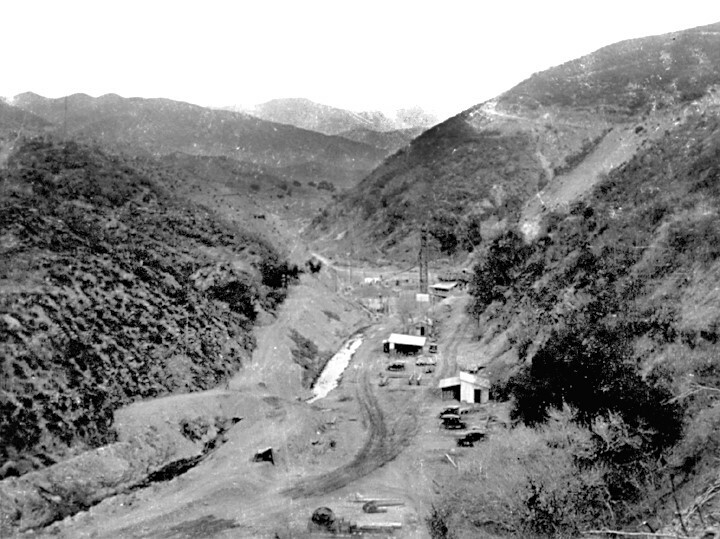 (1925)*^* - Preliminary work begins at the base of San Francisquito Canyon. 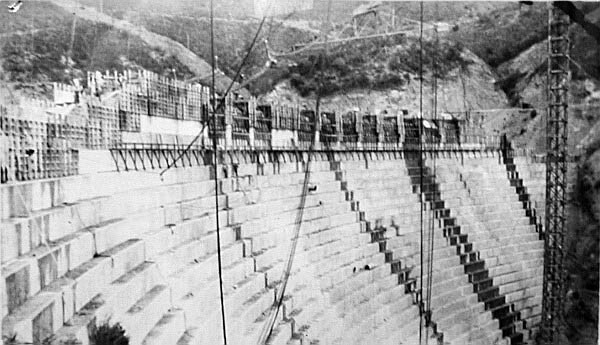 On March 9th, 1925, preliminary work began in preparing for the construction on the 600-foot-long, 175-foot-high St. Francis Dam. (1925)* - Construction site of the St. Francis Dam showing tower, concrete mixing shed and runway. (1925)**^ - View showing the construction of a new "wing dyke" to accomodate mid-construction design changes. (1925)**^ - The St. Francis Dam nearing completion. A mid-construction design change increased the total height of the dam to 195 feet. (1928)^^^ - William Mulholland, Superintendent of the Bureau of Water Works and Supply of Los Angeles, pointing towards something in the distance. 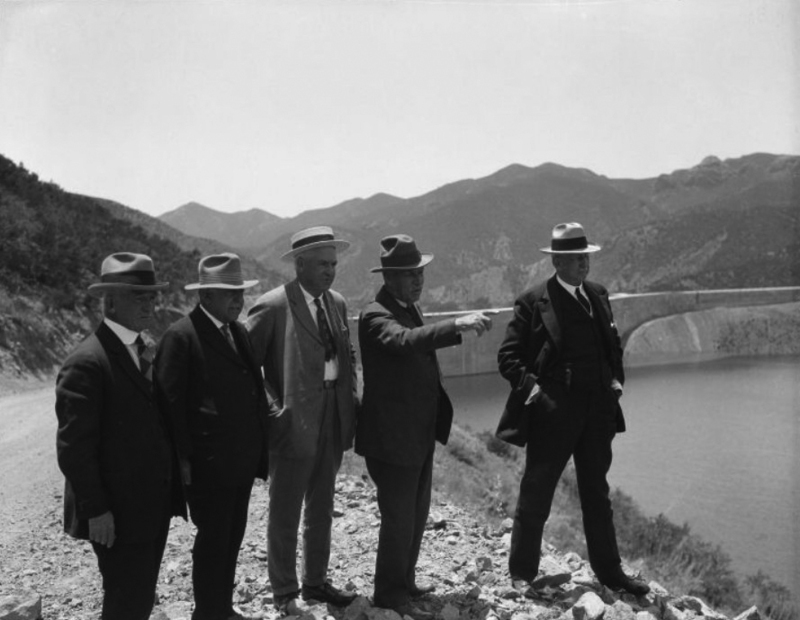 Mulholland is with 4 other men on the east bank of the St. Francis Reservoir with the top of the St. Francis Dam visible behind them. (1928) * - Aerial view of St. Francis Dam close to the time of its failure. The lake behind the dam continues to be filled. It took two years for the reservoir behind the dam to completely fill. Some water stains can be seen on the wall. 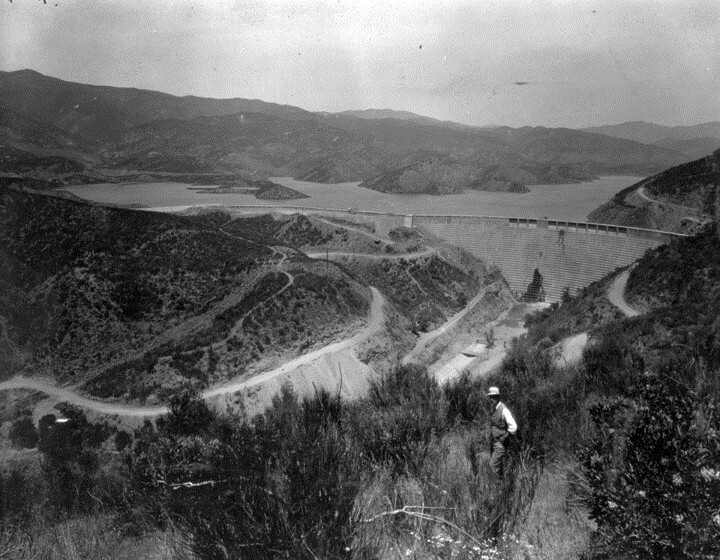 (1928)*# - View showing the St. Francis Dam with the lake behind it now filled to capacity. The small island at center-left is now almost completed submerged (compare to previous photo). (1928)* - This pre-failure photograph shows the exterior of the dam and surrounding countryside. This was taken just before the break. 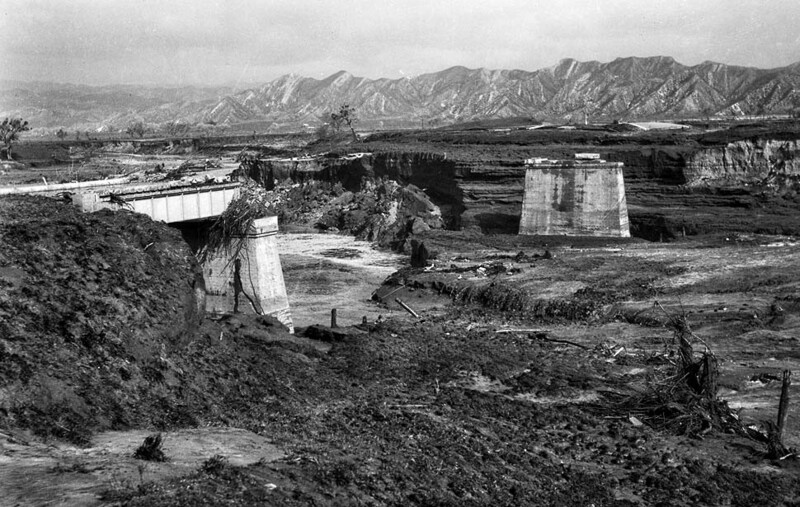 (1928)**^ - View of the St. Francis Dam just hours after its catastrophic failure (11:57 p.m., March 12, 1928). It took only 70 minutes for entire 12.4 billion gallons of water to drain out of the man-made reservoir supported by the dam. 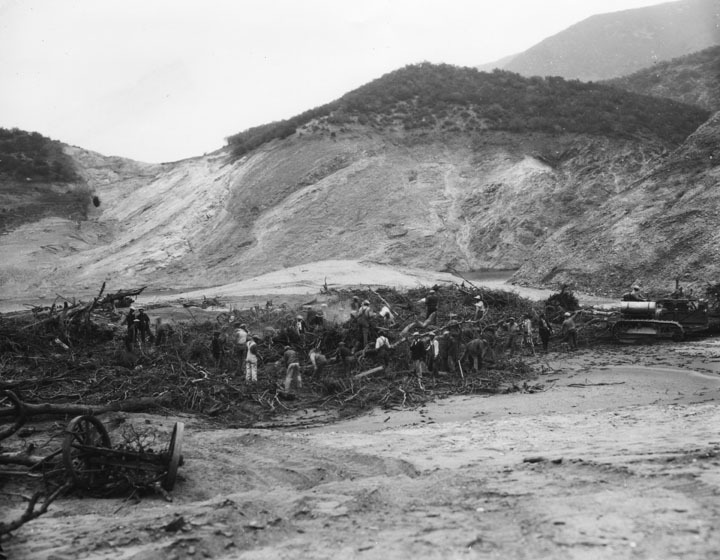 (1928)** - View showing the aftermath of the St. Francis Dam collapse. The water line can be seen on the hills in the upper-right. 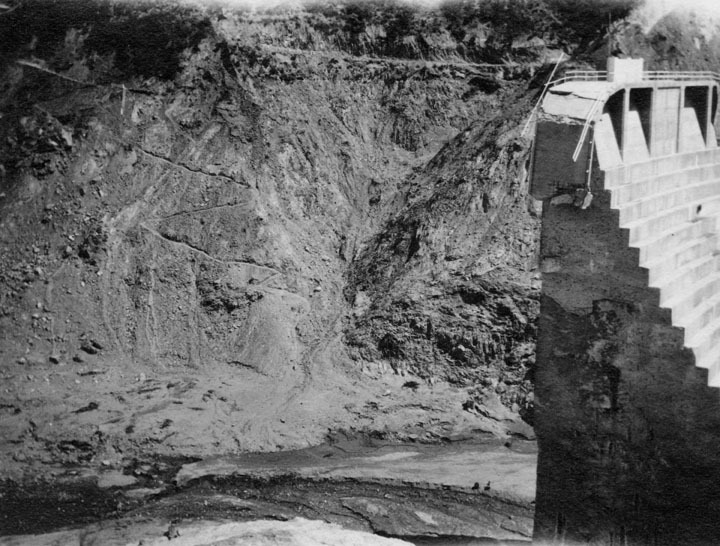 (1928)* - This post-failure photograph shows the stream of remaining water coming down from the dam. Only one center piece of the wall remains standing, both ends having been washed away. 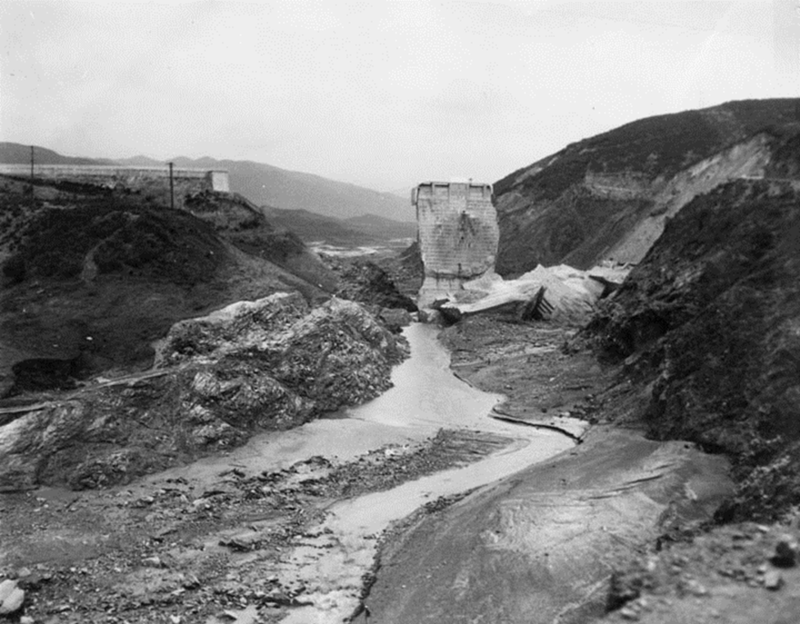 (1928)^^* – View of the last remaining standing section with crumbled sections at base, water still streaming downhill. 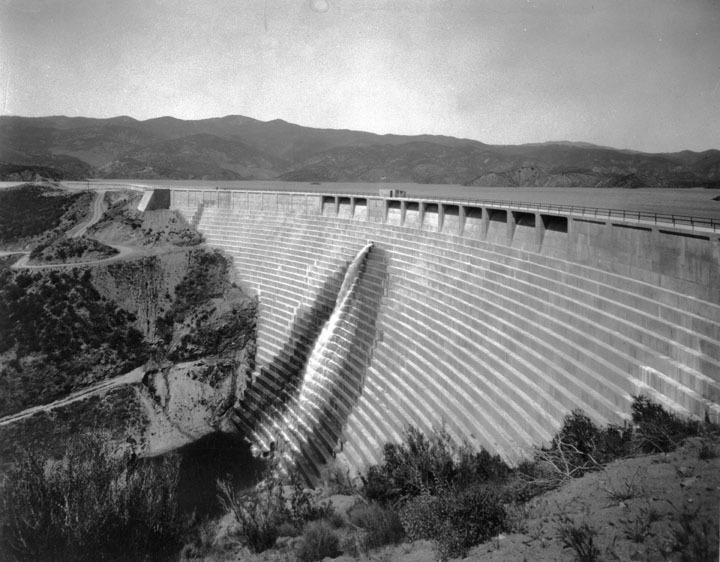 The first community struck after the dam's demise was Castaic, which was said to have been "swept clean as a pool table." Minutes later, a power company camp in the river valley was washed away leaving 84 people dead Portions of the towns of Piru, Fillmore, Santa Paula and Saticoy were completely demolished. 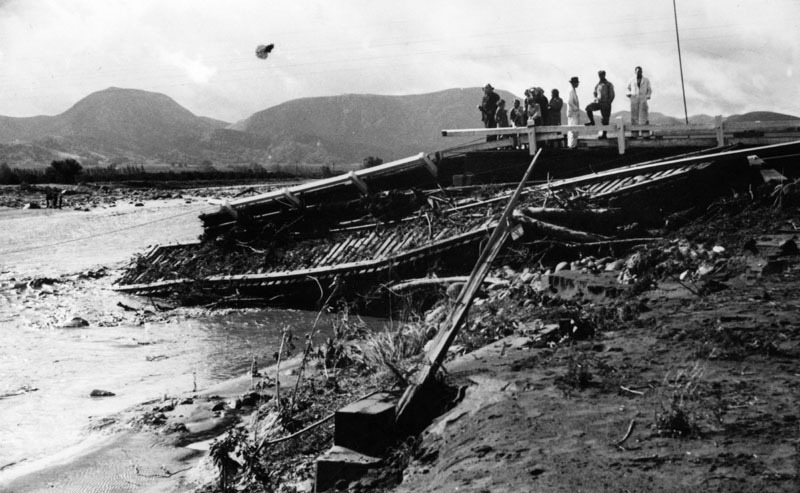 Nearly 500 people were killed in the flood. 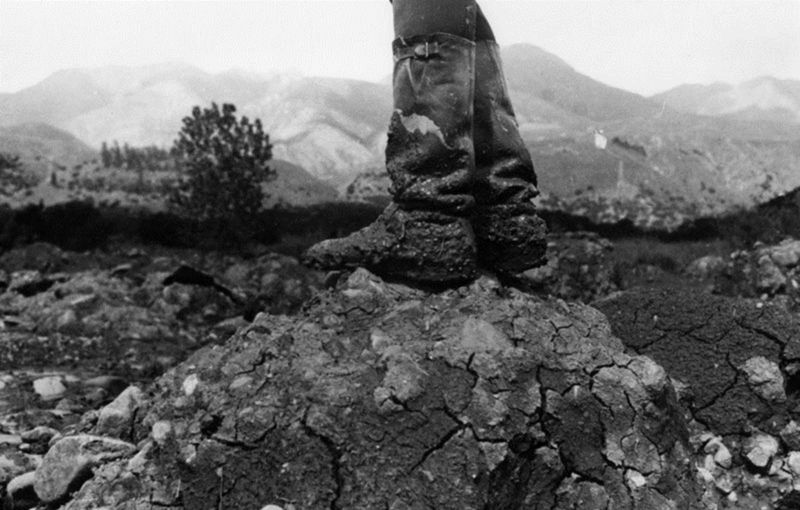 (1928)* - A man in rubber boots stands atop a mound of rocks and mud formed as a result of the failure of the St. Francis Dam in 1928. 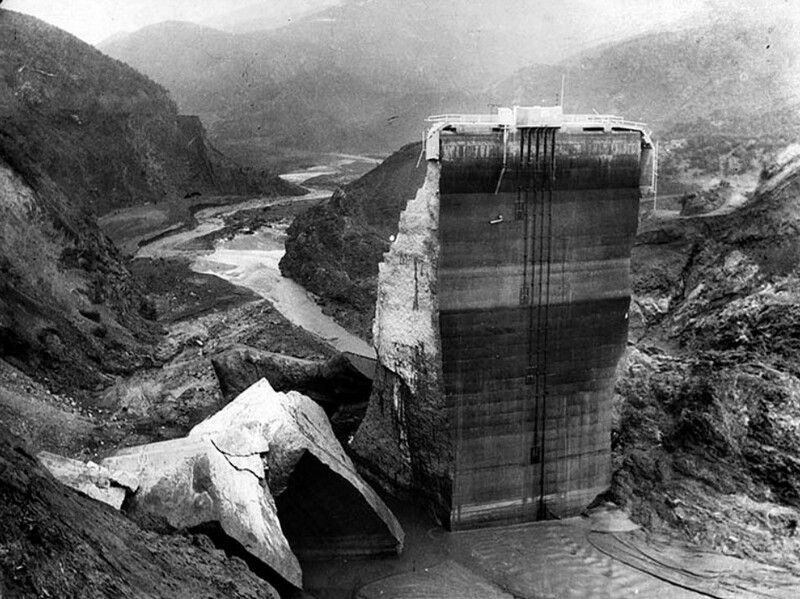 The dam collapsed in March of 1928 at 11:57 p.m., sending 12 billion gallons of water rushing down the Santa Clara River Valley. 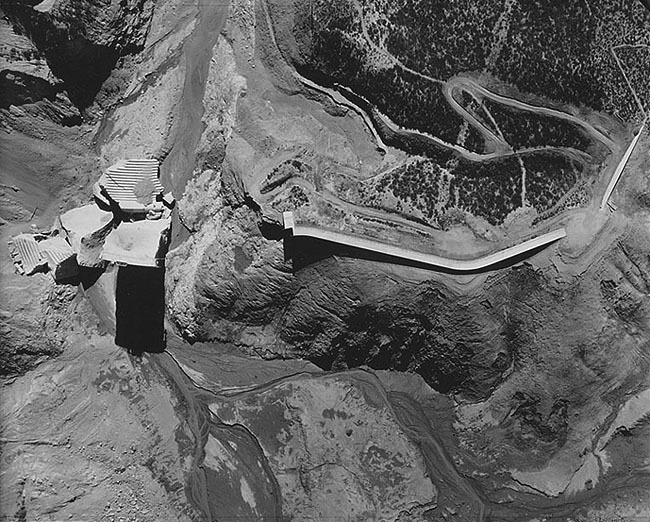 (1928)*^ - Aerial view from directly above the collapsed dam. 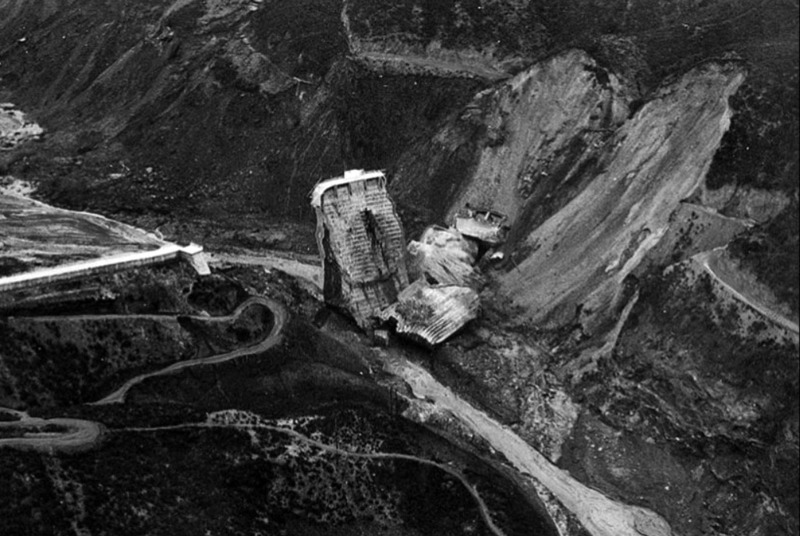 (1928)^^* - Aerial view showing the aftermath of the dam's destruction. Only the singular center section of the dam remains upright. The hillside displays signs of a major landslide. 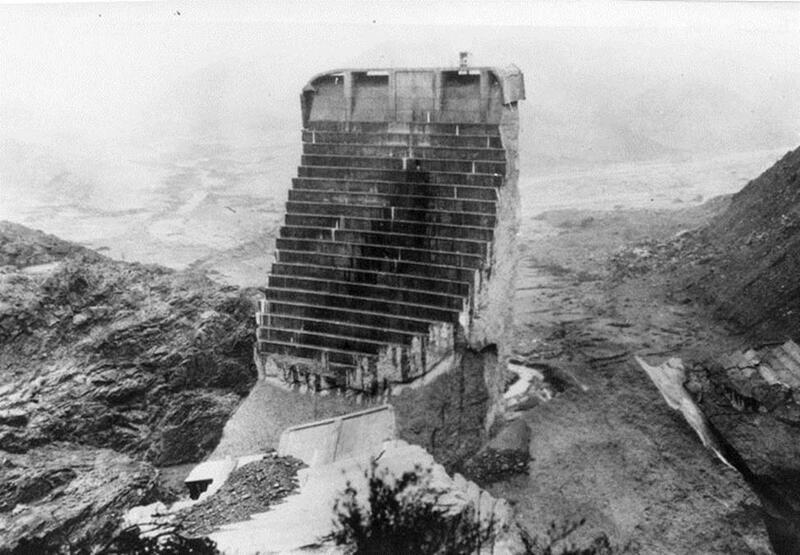 (1928)* - Ground view showing several men looking very small as they stand in the area below the failed dam. One large chunk of dam remains standing while another lays on the ground below it. 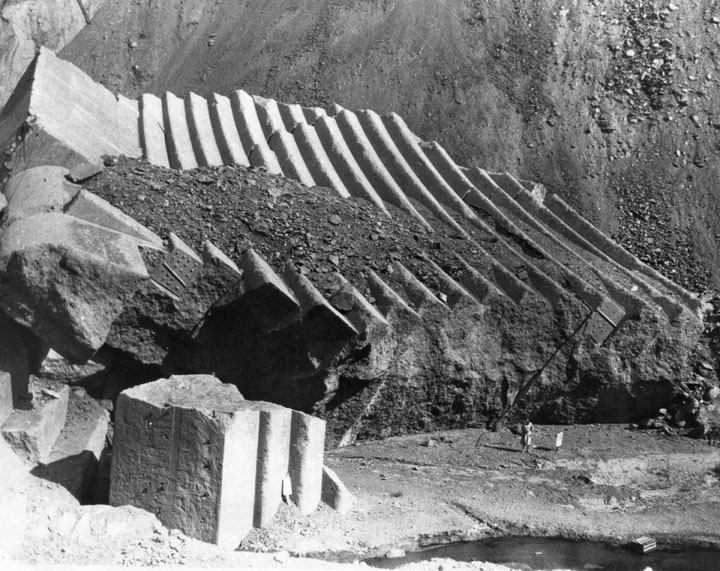 (1928)*^^ - Several men stand at the base of the collapsed dam's remains. 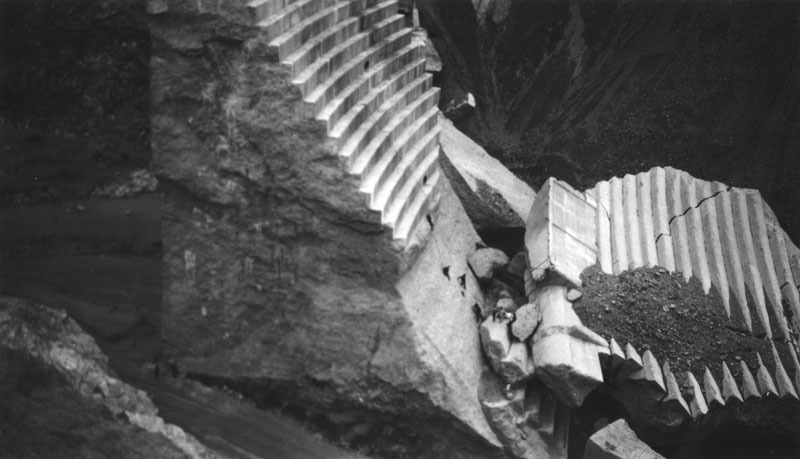 (1928)^*^ – Close-up view of the last remaining standing section of the St. Francis Dam, also referred to as “Tombstone”. Three men are seen climbing the debris at its base. 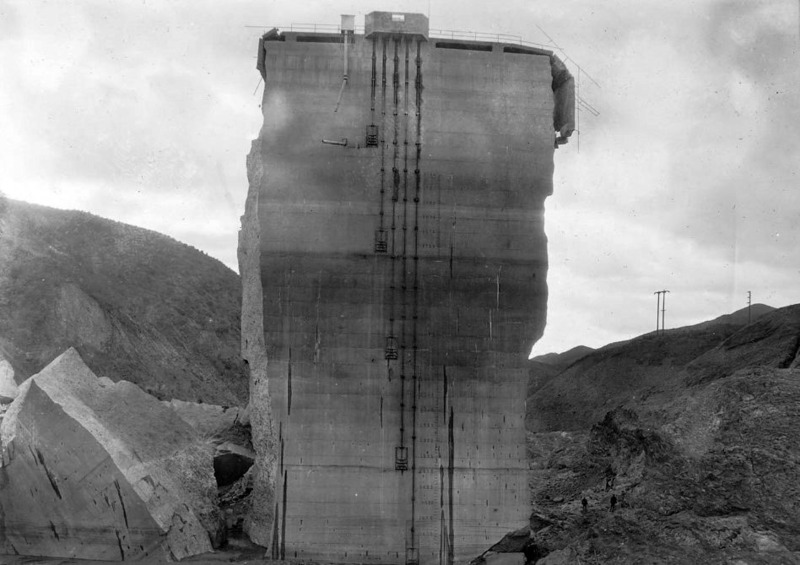 Side view of a massive concrete slab nicknamed "The Tombstone". 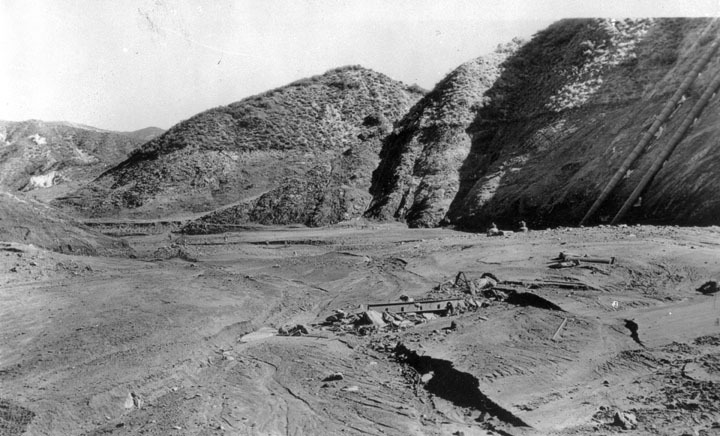 This is the center section, and the only remaining portion, of the St. Francis Dam after its disastrous collapse in March 1928. Several large concrete blocks can be seen scattered throughout the area, and a few people can be seen along the road at the base of the mountain as well as atop a remaining portion of the bridge in the far distance. (1928)* - Photo shows edge of the major piece still standing, and to the left of it a little of the water still left in the area. At the top left is a road closed by land slippage. 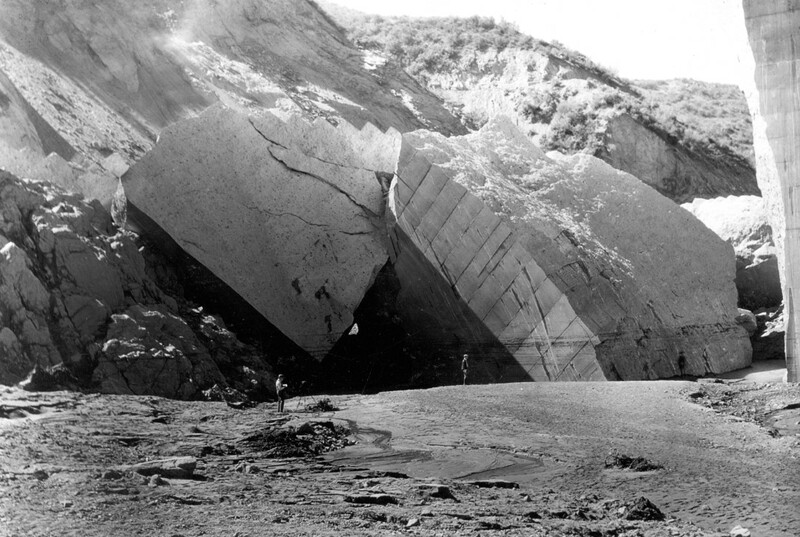 (1928)* - A woman can be seen standing on the ground below some of the huge pieces of the failed dam which were washed down by the 100 foot high wall of water which raced towards Ventura. 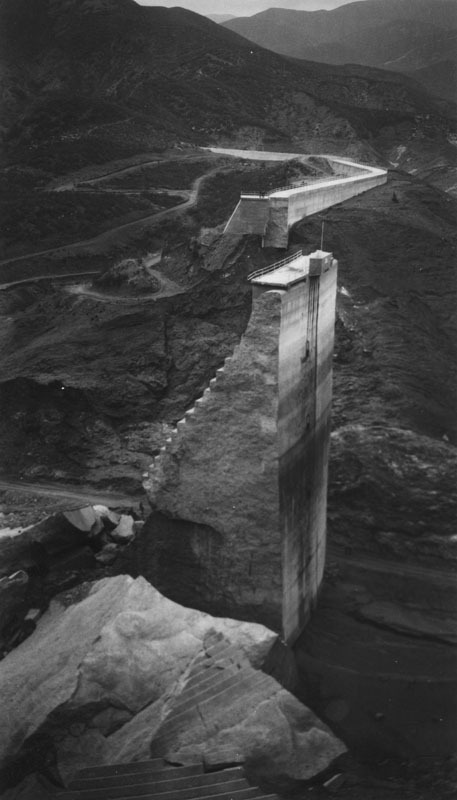 (1928)* - Sightseers climb large chunks of concrete, St. Francis Dam. (1928)* - Aerial view of the remaining, standing piece of the failed dam. Water soaked land and a small stream can be seen below and behind it. 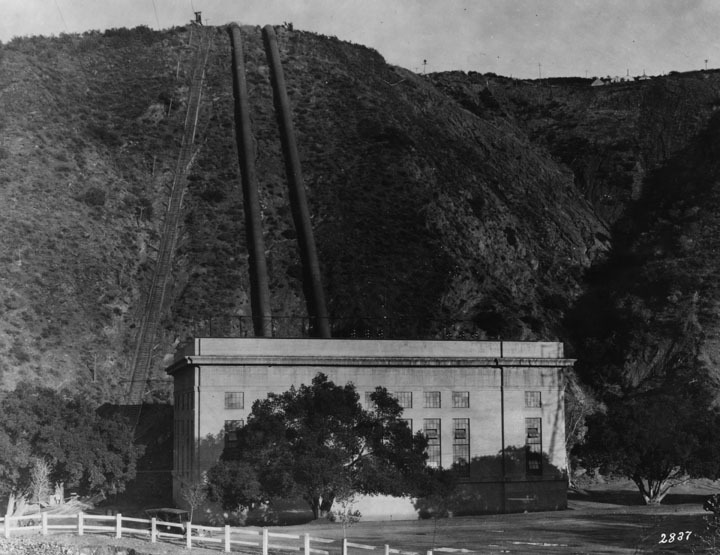 (1920)* - This pre-failure photograph shows the exterior of the San Francisquito Power Plant No. 2 at the base of a hill with pipes (penstocks) running up the hill. The plant was directly in the path of the flooding water. (1928)* - The ruins of the San Francisquito Power Plant No. 2 are clearly visible from the canyon road above. The plant's penstocks can also be seen in the upper right. 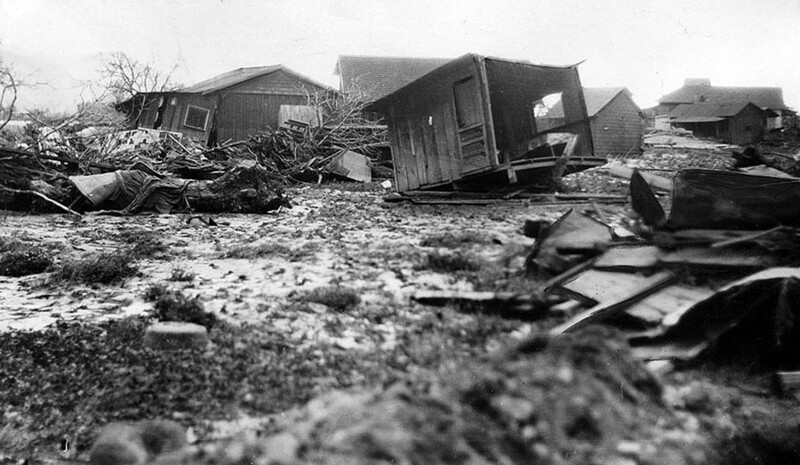 (1928)* - Generators stand in the rubble of Power Plant No. 2 which stood just 5 miles north of Newhall. 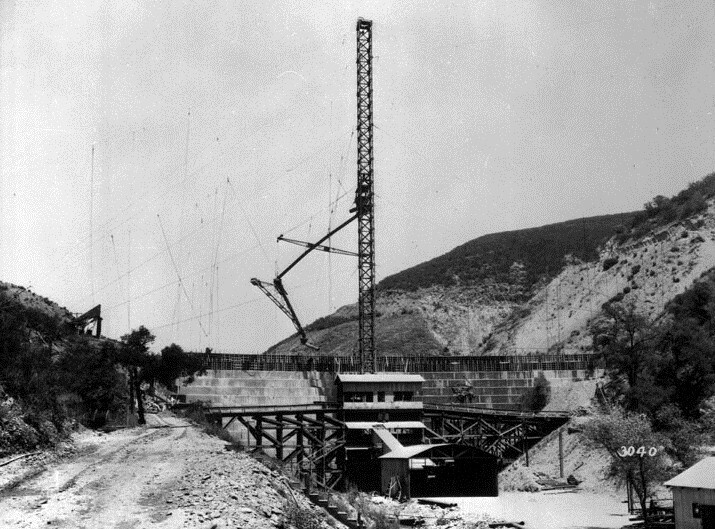 (1928)^^* – View of Main Highway Bridge one and one-half miles from Castaic. 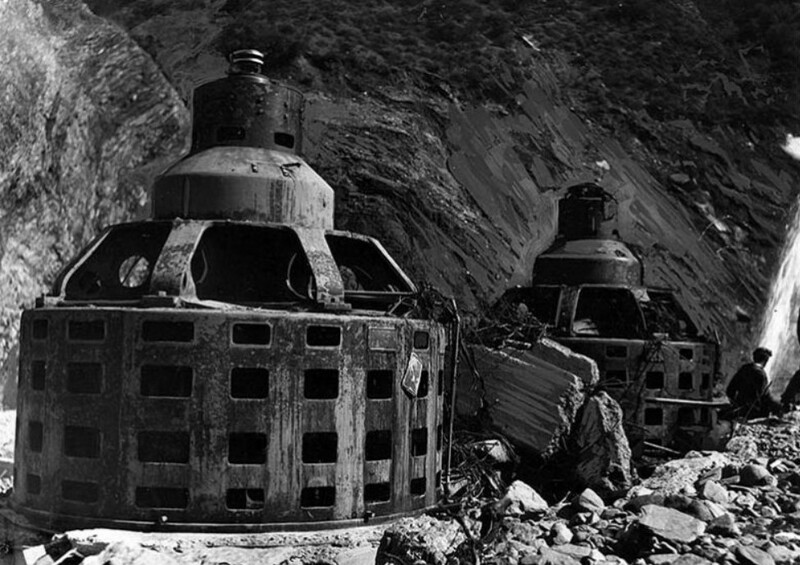 Only the supports survived the flood waters following the St. Francis Dam collapse. (1928)* - This post-failure photograph shows men working in a field of broken trees, wagons and other debris attempting to clear it away. A caterpillar tractor is visible on the right side. 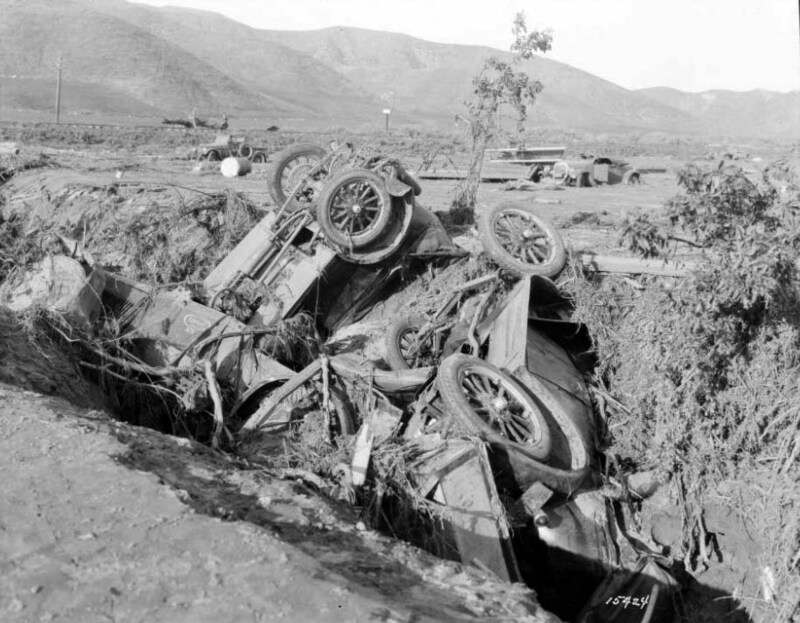 (1928)^** - Twisted company auto wreckage marks the site of the Southern California Edison Kemp Camp which was destroyed in the flood. Just past the Ventura County line along the Santa Clara River was a railroad siding called Kemp. There, a group of 150 workers for the Edison company were fast asleep in a tent camp used while they were building a transmission line. Night watchman Ed Locke watched in horror as the huge flood of water approached the camp. He ran through the camp, waking up as many people as possible. 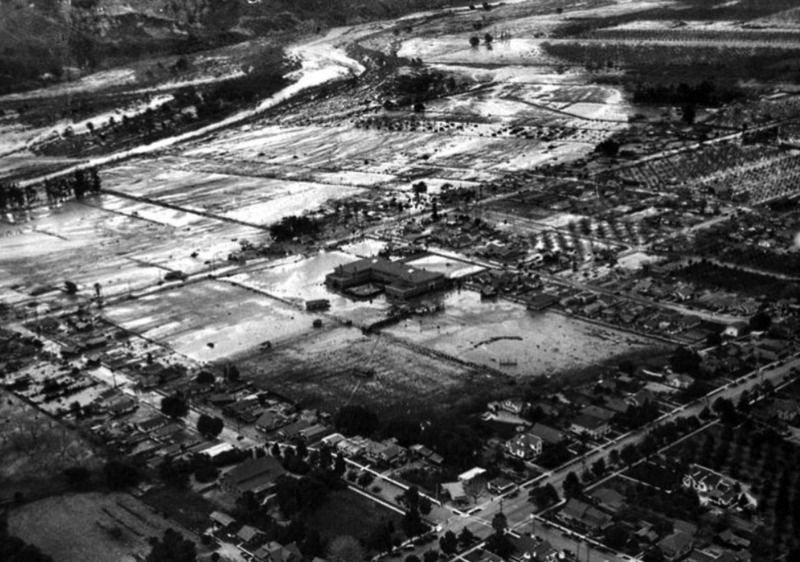 (1928)^^* - Aerial photo of the City of Santa Paula following the collapse of the St. Francis Dam. This photo was published on page one of the March 14, 1928 LA Times. There were other heroes to recognize at Santa Paula. Louise Gipe, a night telephone operator at Santa Paula, received a call from the Pacific Long Distance telephone operator at 1:30 a.m., warning of the flood headed her way. Ignoring the peril to her own life, she stayed at her post, notifying California Highway Patrolman Thornton Edwards and calling residents in the low-lying areas of Santa Paula to warn them about the impending flood. There's a monument to their deeds in downtown Santa Paula, a sculpture called "The Watchers" that depicts the two motorcycle policemen who rode through town spreading the word. 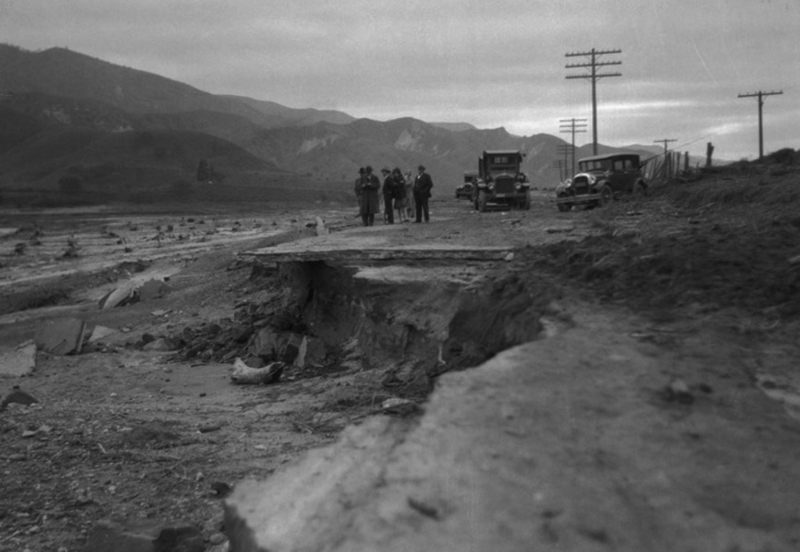 (1928)* - People examine the damaged road and washed away railroad track, caused by excess water flowing down the Santa Clara River after the failure of the St. Francis Dam. 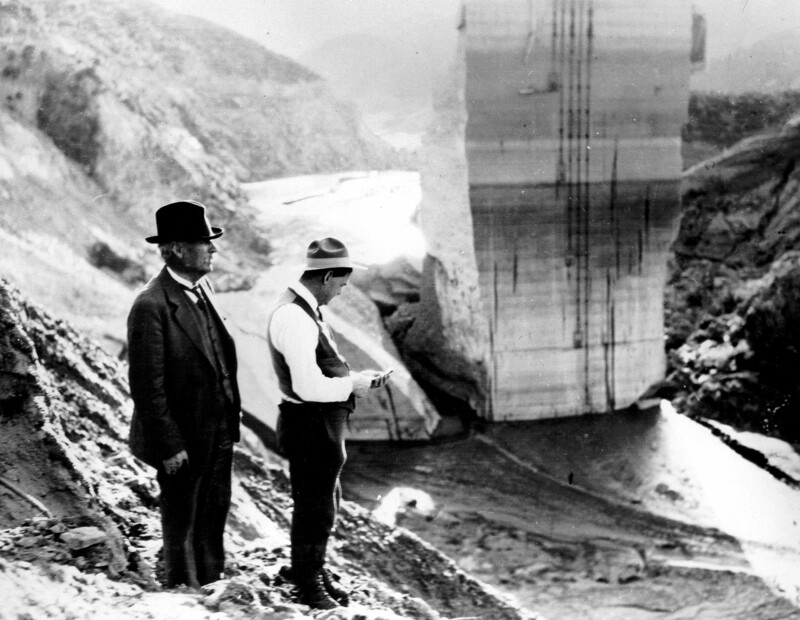 (1928)^^^ - Officials on the edge of the wide path of the flood that followed the failure of the St. Francis Dam. (1928)^^ - St. Francis reservoir a day or two later after all 12.4 billion gallons had drained out of it less than 70 minutes. The water line can be seen on the face of the mountains. 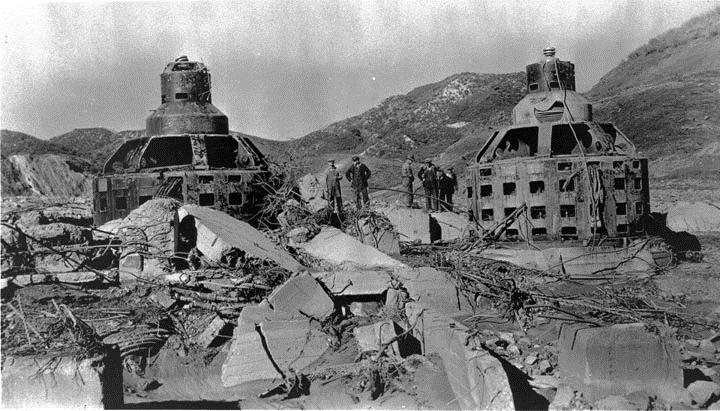 (1928) – William Mulholland and H. Van Norman stand on the hillside overlooking St. Francis Dam ruins shortly after it failed. 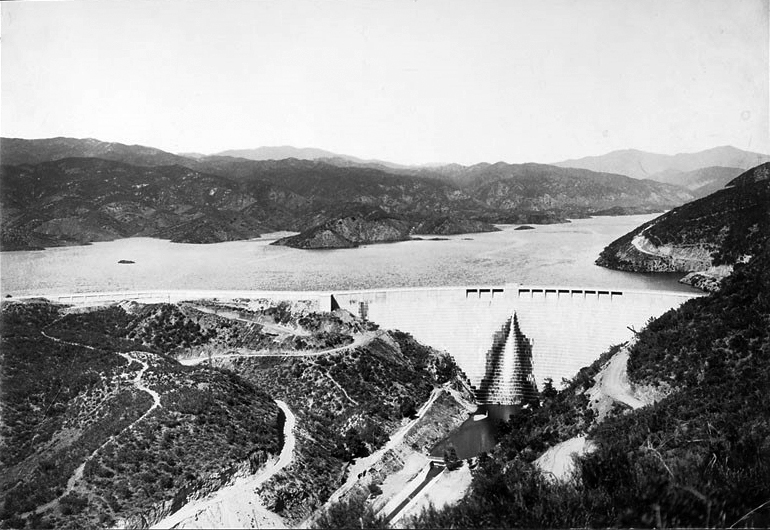 Click HERE to see more in Early Views of the Mulholland Dam and Hollywood Reservoir. (1928)^^^ - Coroner Frank Nance and engineer H. A. 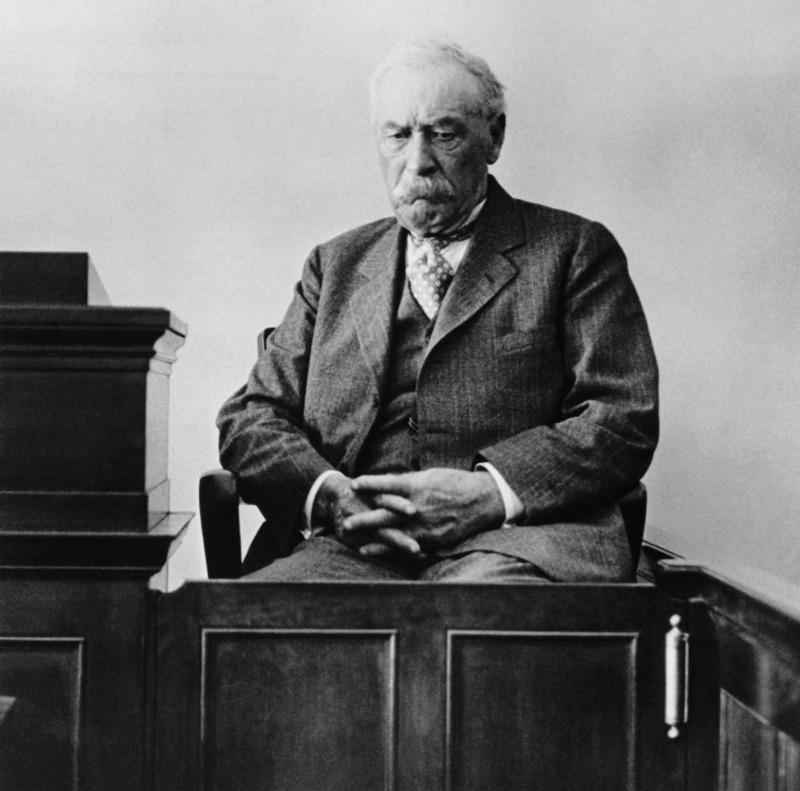 Van Norman at the Coroner's Inquest following the failure of the Saint Francis Dam, Los Angeles. 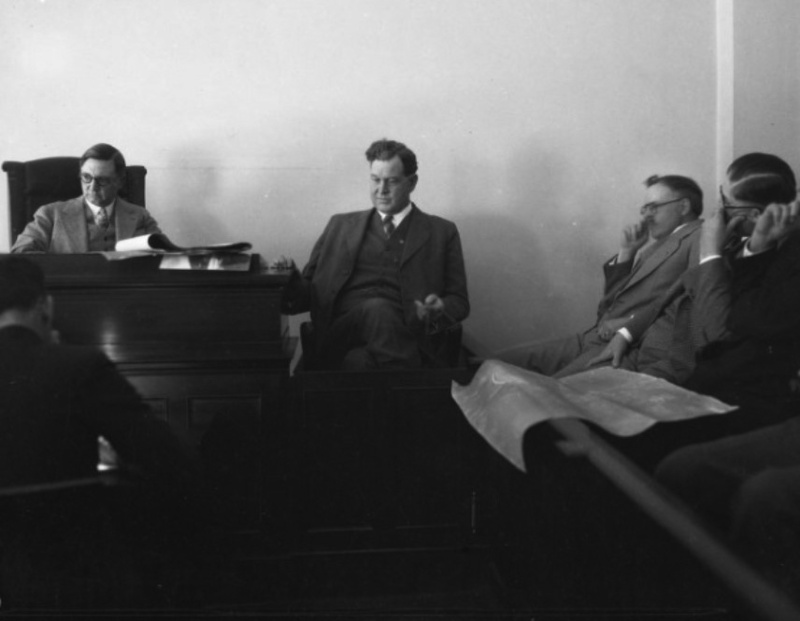 (1928)#* - View showing William Mulholland testifying on the witness stand on March 26, 1928 in Los Angeles, at the coroner's inquest. Mulholland took responsibility in a way that no public figure would today. During the official inquest, he claimed the mistake as entirely his own. “The only ones I envy about this thing are the ones who are dead,” the crestfallen chief announced.